The Remy Racing and Performance Products division of Knopf Automotive supplies world-class OE products to the racing market, including the steering specialists who supply NASCAR, as well as to those that supply the various local “Saturday Night” race circuits. Our products are also in use by the off-road and rock-climbing racing and performance markets. Finally, our products have multiple applications in the automotive restoration market. The following are the products supplied by Remy Racing and Performance Products to the racing, performance and restoration markets. Remy Racing & Performance Products is committed to providing the restoration market with the highest quality products. "ORIGINAL EQUIPMENT". All of our products offered at Remy Racing & Performance are OE, Nothing rebuilt, Nothing made off shore. The Delphi 600 series Power Gear utilizes the latest in steering technology including a rack & pinion style servo and specifically tuned effort characteristics. The gear provides quick response and precise control. The recirculating ball gears offer low friction with smooth and quiet operation throughout the entire steering range. This produces excellent road feel and driver feedback just like that found in modern day cars and trucks. 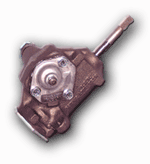 The "Vega" GM 140 manual steering gear has a highly efficient ball bearing screw that greatly reduces steering effort. It's compact size and low weight of 12 lbs. increases potential applications. Field experience and laboratory test prove long life characteristics and is easily adaptable to any basic steering system. A variety of mounting options are available to increase flexability of usage. Units are sealed for virtually maintenance free service. Our "Vega" GM 140 manual steering gear is the gear of choice for most Street and Hot Rod builders the industry over. The GM 525 manual steering gear has a highly efficient ball bearing screw that greatly Reduces steering effort. This gear is made with the original OEM tooling and is held to the highest quality standards. 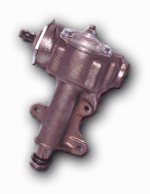 Originally used on all manual steering equipped GM A-Body, B-Body, F-Body, X-Body and a variety of Jeep applications, this is a direct Replacement for your worn out original 525 manual steering gear. The GM Corvette steering gear has a highly efficient ball bearing screw that greatly reduces steering effort. This gear is made with the original OEM tooling and is held to the highest quality standards. 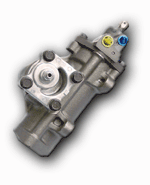 Our Corvette steering gear is the exact fit and appearance that only an OE gear can provide. Please call Adam Lombardo at (631) 738-1801 or Email Remy Racing Products for more information, ask about our OEM power steering pumps and components.